Good boat maintenance is one part of marine safety planning. Being a cautious and skilled navigator is another. But the ocean and the weather can conspire against you! Having a way for people to find you if your crew and your boat is in distress might save your life and that of your passengers some day. 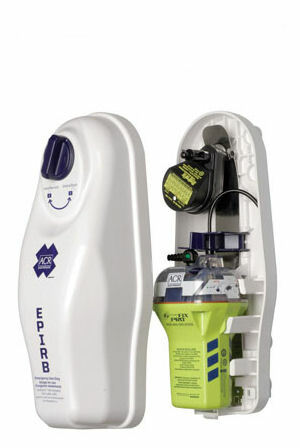 The acronym EPIRB stands for Emergency Position-Indicating Radio Beacon and has two categories. (See the U. S. Department of Homeland Security's Navigation Center for more information). PLEASE NOTE: Beginning Feb. 1, 2009, the Coast Guard and other search and rescue personnel will only receive distress alert broadcasts using digital 406 MHz EPIRBs. Search and rescue satellites will no longer process older model analog EPIRBs that only transmit on 121.5 or 243 MHz. 406/121.5 MHZ. 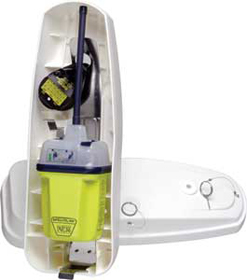 Float-free, automatically activated EPIRB. Detectable by satellite anywhere in the world. Recognized by Global Maritime Distress & Safety System. 406/121.5 MHZ. Similar to Category I, except is manually activated. Some models are also water activated. The 406 EPIRB’s signal is 50 times more powerful than the 121.5 beacon’s, allowing satellites to better detect its signal and provide a more accurate search area for rescue crews. The all new GlobalFix™ iPRO Emergency Position Indicating Radio Beacon (EPIRB) is the next generation in marine safety electronics. The GlobalFix™ iPRO is a breakthrough product that boasts a digital display and dual GPS technology. 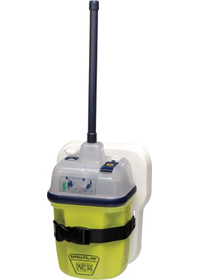 The GlobalFix™ iPRO is also the first EPIRB that offers Dual GPS Technology. Interface your iPRO to your onboard GPS to ensure that your LAT/LON is stored inside so the coordinates are transmitted in the first data burst. iPRO's internal GPS is optimized for cold starts and is tested and refined at ACR's GPS Simulation Center so that it will pin-point your exact location faster than standard GPS enabled EPIRBs. Meeting the demands of both commercial mariners and recreational boaters, the new McMurdo SMARTFIND heralds the arrival of the next generation in EPIRB technology. This compact and stylish unit is available as a standard 406 MHz EPIRB or for enhanced position location, with a built-in high accuracy GPS. 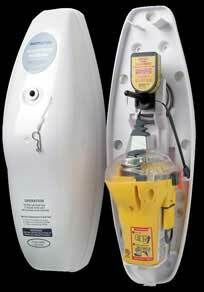 EPIRB sealing depth: Waterproof to 32.8 ft. Programming Interface: Message Formats: By infra-red link via USB light pen and Windows based EPIRB National, Standard and User Location Protocol as applicable, plus EPIRB user protocols. Serialized, MMSI and radio call sign. You may be fined for false activation of an unregistered EPIRB. The U.S. Coast Guard routinely refers cases involving the non-distress activation of an EPIRB (e.g., as a hoax, through gross negligence, carelessness or improper storage and handling) to the Federal Communications Commission. The FCC will prosecute cases based upon evidence provided by the Coast Guard, and will issue warning letters or notices of apparent liability for fines up to $10,000. However, the Coast Guard has suspended forwarding non-distress activations of properly registered 406 MHz EPIRBs to the FCC, unless activation was due to hoax or gross negligence, since these search and rescue cases are less costly to prosecute. If you purchase a new or a used 406 MHz EPIRB, you MUST register it with NOAA. If you change your boat, your address, or your primary phone number, you MUST re-register your EPIRB with NOAA. If you sell your EPIRB, make sure the purchaser re-registers the EPIRB, or you may be called by the Coast Guard if it later becomes activated. An FCC ship station license is no longer required to purchase or carry an EPIRB.